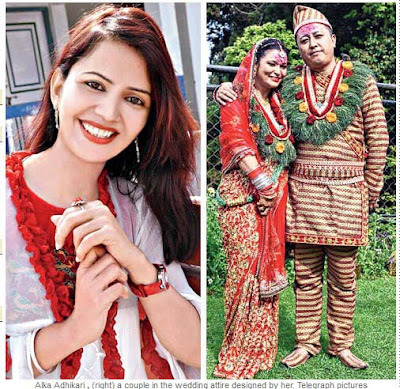 A collection of "Gorkha-Indian fusion" attires designed by a Siliguri-based designer has become popular at weddings of the Gorkha community across the country and abroad. Alka Adhikari, who has been in the designing profession for the past 15 years, specialises in ethnic costumes. However, for the past couple of years, she has been creating a mix of Gorkha and Indian clothes that has caught the fancy of young Gorkha couples. "I have interest in designing Nepali costumes since childhood. I used to make fariya choli and daura suruwal for my dolls then. I took up my hobby as a profession and have been making ethnic costumes for the past 15 years," said Alka. The idea of fusion costumes came as she wanted to get youngsters admire and wear their traditional attire, ornaments and accessories. "Young people nowadays show little interest in their traditional costumes, culture and food. Even during weddings, the brides and grooms opt for costumes like lehenga choli, saris, sherwanis and suits. The traditional Gorkha costumes and ornaments were losing their relevance. This made me think as to how I could make young people appreciate and wear their traditional attires," said the designer. Alka said she gets orders for wedding attires of brides and grooms mostly from Assam, Uttarkhand, Patna, Rajasthan and Bangalore and even from countries like the UK, USA, Canada and Thailand. "The unique designs have caught the fancy of young brides and grooms as they want to look different and showcase their ethnic wear during their weddings. The demand is not just from the bride and groom but also their family members. Other than weddings, my costumes are in demand for functions like name-keeping and weaning ceremonies of babies and festivals like Teej, Dasain and Diwali," said Alka. Some of her attires include maruni dress designed like lehenga with makhmali choli, sari with dhaka border, 'Rajasthani jamawar lehenga' with chaaubandi choli and taas kuchin coat with lehenga. Charkey tilhari, nau gedi potey, kantha, hansuli, lalupatey headdress, thaili are some of the ornaments and accessories to go with the costumes. Sherwanis made of dhaka and brocade, three-piece daura suruwal made of dhaka complete with embellished patukis, matching Nepali cap and shoes made of dhaka are some of the costumes for men. Deepa Sharma from Siliguri, who got married last month, opted for Alka's costumes as they are unconventional and reflect the Gorkha culture in a unique way.